Palestinians inspect a military observation post that was hit by an Israeli tank shell east of Khan Younis, southern Gaza Strip, July 20, 2018. Israel pummeled Hamas targets in Gaza killing four Palestinians Friday in a series of air strikes after gunmen shot at soldiers near the border, officials said. Israeli airstrikes pummeled Hamas targets in Gaza, killing four Palestinians, mostly Hamas operatives, after Palestinian snipers killed an Israeli soldier near the border Friday, officials said. The military said a “terrorist squad” fired at troops, and one soldier was severely injured and later died of his wounds. He was the first Israeli military fatality in months of violence along the Gaza border. After the Palestinian gunfire, Israel’s military said, it struck 25 Hamas positions, including weapon warehouses, command and control centers, training facilities, observation posts and other sites. Palestinian medics carry a wounded man into a field clinic after being shot by Israeli troops during a protest at the Gaza Strip's border with Israel, July 20, 2018. Israel carried out airstrikes and deployed tanks at militant sites in Gaza killing four Palestinians Friday after gunmen shot at soldiers near the border, officials said. Earlier Friday, Israel’s Defense Minister Avigdor Lieberman visited Sderot, an Israeli town near Gaza that has been hard hit by Palestinian rockets over the years. “The heads of Hamas are forcibly leading us to a no choice situation in which we will need to embark on wide and painful military operation,” Lieberman said. Israel says it has no interest is engaging in another war with Hamas, but says it will no longer tolerate the Gaza militant campaign of daily flying incendiary kites and balloons across the border that have torched Israeli crops, burned nature reserves and killed wildlife. The weekly protests led by Hamas against Israel are meant in part to draw attention to the Israeli-Egyptian blockade imposed after the militant group assumed control of Gaza in 2007. Military spokesman Lt. Col. Jonathan Conricus said Palestinians hurled seven grenades and several explosive devices at troops along the border Friday. There were no Israeli casualties. The demonstrations have been fueled in large part by pervasive despair caused by the blockade, which has caused widespread economic hardship. 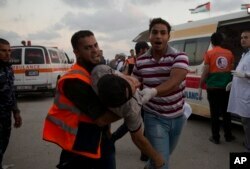 More than 135, mostly unarmed, Palestinians have been killed by Israeli fire since the border protests began March 30.